Valentine's Day is tomorrow! Time to shave my legs...ah kidding...kind of. On a serious note, no one likes dry dusty elbows and knees right? I know my man definitely appreciates it when my legs are shaved and my skin is soft. Exfoliating your body on weekly basis will keep your skin looking healthy and rejuvenated. Making your own body scrub is easy and quite cost effective. I personally like to use sea salt in my scrubs but you can also use sugar. Helps to replace lost minerals into the skin. I only recommend using this on your body. For a more gentle scrub that can be used on your face you can read this post. Get your salt scrub on and have glowing skin by tomorrow! Another great tip! It sounds delicious too, I might eat a bit. I use the Lavender salt scrub from Trader Joe's and L-O-V-E it! I need to shave my legs too! :-) No joke! Ooh I love homemade scrubs! I made a sugar scrub with peppermint and grapefruit essential oils and it smelled so good! I want to try this one with the sea salt! I bet this smells heavenly! Thanks for the recipe friend! Hope you have a great Valentines this week! Yesterday I was in the shower, alone lol, and M was also in the bathroom and I asked him if he'd shave my legs for me if I ever got pregnant/and or too fat to do it myself. HE said yes, so then I asked if he'd do it now, and he said no dang it lol. This looks awesome! I just pinned it and will be doing it soon! great scrub recipe! thanks sis! Amazing! I'm going to definitely try this out :) Thanks for sharing! i love my sugar scrub from fresh but it's expensive. i'm going to try this! Ahh, I love a good scrub! And I've been meaning to do some research on how to best exfoliate my face - let me know if you have any advice! Sea salt + lime + virgin coconut oil makes a good exfoliator too! 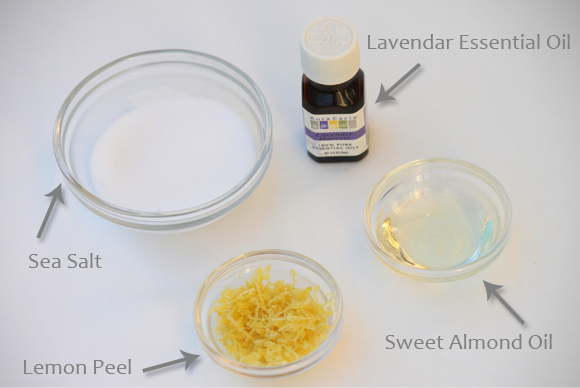 Is lavender oil and sweet almond oil easy to find? Can you get them at the grocery store or do you need to go to a health food store? I love scrubs. Usually I use St. Ives apricot scrub. I'm not sure whether you would recommend that kind or not. I'd really like to try making my own and this doesn't sound difficult at all.